As worn during the Battle of Tippecanoe, the War of 1812, the Red Stick War, etc. In 1810, the US Army adopted a new uniform designed to be more French in appearance. 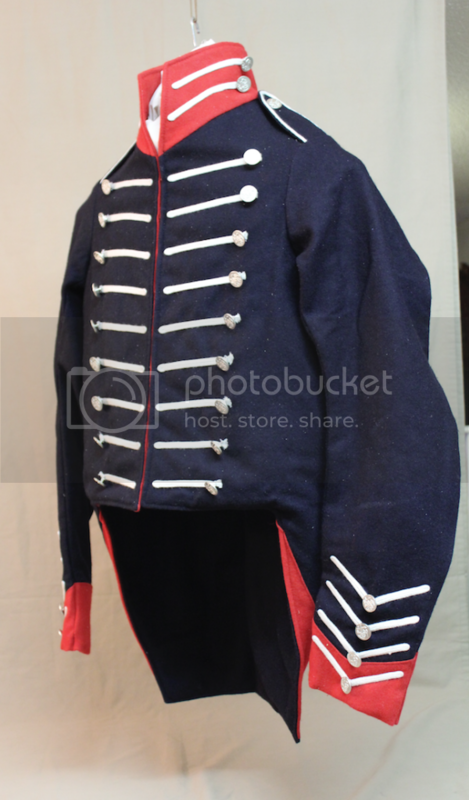 This uniform coatee was of a dark blue wool, fastened at the front with a series of hooks and eyes, and having a red collar, cuffs, and turn backs. The coatee was further trimmed with two rows of ten buttons, set one row on each side of the breast, and connected by round profile white cording 'in imitation of buttonholes.' The cuffs and skirts were further trimmed in four rows of buttons with cording set in herringbone (or 'V') fashion. Additionally, the collar also had two buttons with false buttonholes. It was not until the spring of 1812 that a new pattern coatee was adopted. Even so, plenty of the 1810 pattern uniforms were still on hand and continued to be issued and worn until supplies were exhausted. In the Southern Department, the 1812 regulations were not even announced until early in 1813. Some US forces in the Mississippi Territory fighting the Creek Indians were still wearing the 1810 uniforms in 1813 and 1814. 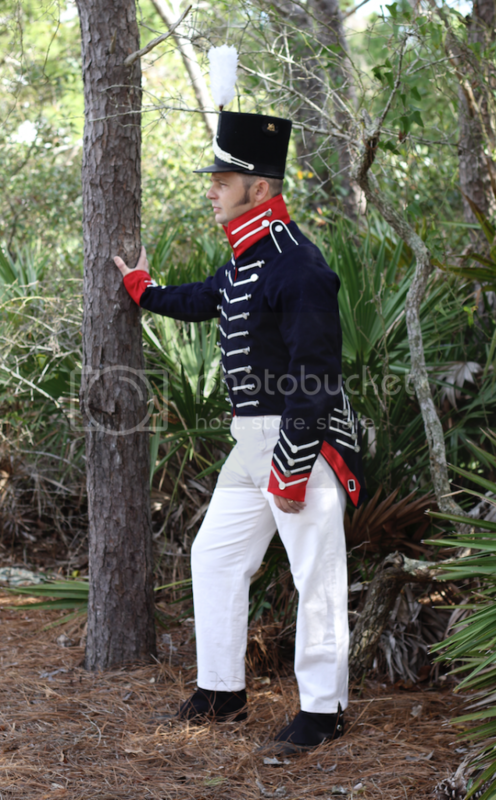 Our reproduction 1810 Coatee is true to the original in form and appearance. The body is made of high quality blue and red wool with a wool and cotton lining. The trim is correct white, round, worsted wool cording. The pewter buttons are the eagle over oval style. It has a period cut with high waist, tall collar, and long sleeves. 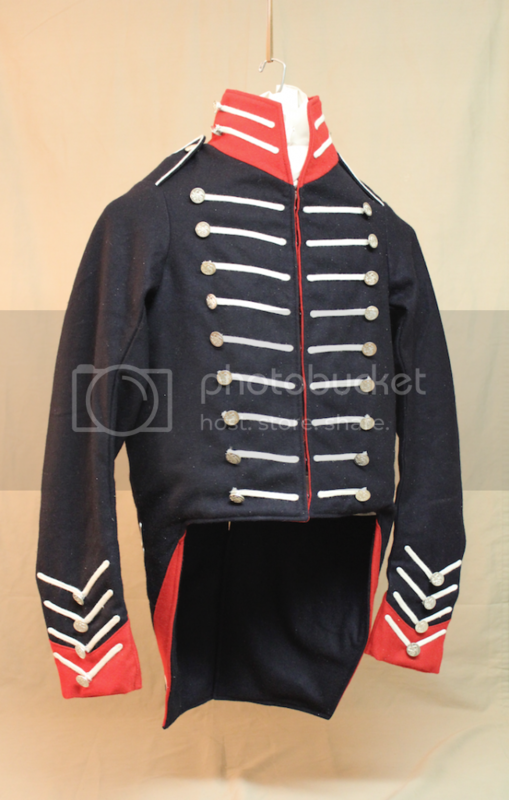 Our 1810 Infantry Coatee also provides an excellent foundation for the creation of other War of 1812 period uniforms. 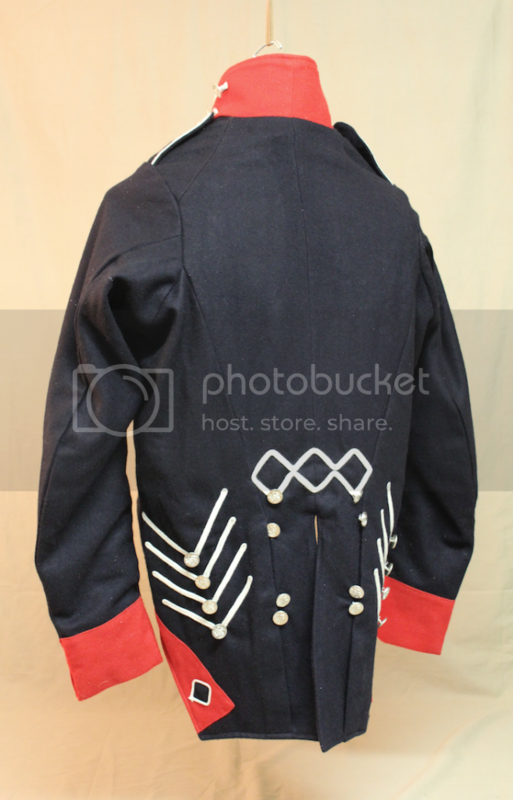 It can be easily altered to create an authentic Officers, Artillery, or Light Artillery coatee by swapping out the white cording for another color/style. It would also be possible to reproduce a number of different militia uniforms by altering the coatee's trim, adding cut-aways, taping, etc. If you are uncertain of your size: Measure with a tape around the chest underneath the arms, with the arms hanging at your side. Take this measurement in inches (Ex: 40 inches), and go up to the next size (Size 42). Shipping for this item is $15.00 to all locations in the 48 states. This amount will not appear on your online receipt, but will be added to your order total.